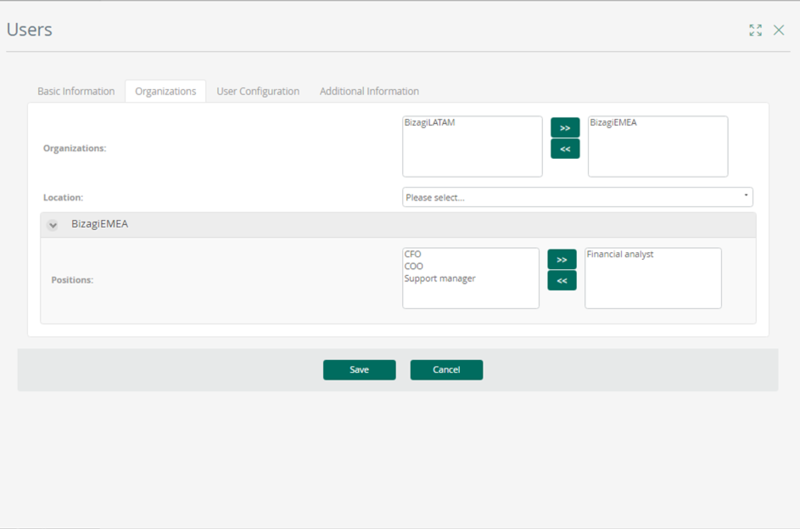 A User is defined as someone who interacts with Bizagi's Work Portal carrying out activities in processes, or managing business information. Each user has an account through which he or she is identified in Bizagi. All the properties defined in the account allow or restrict the interaction with the application. In the Admin options of the Work Portal you will find the Users option. 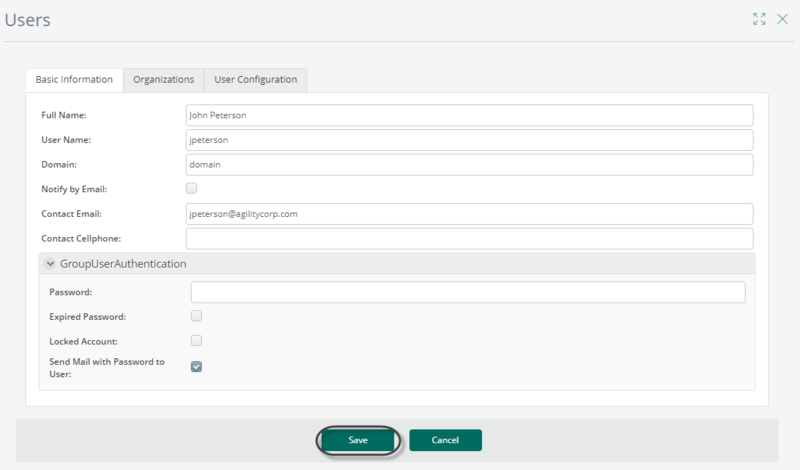 This option allows the administration of users, either updating existing or creating new ones. Keep in mind that users cannot be deleted once they are created. However, they can be disabled if they are no longer needed. 1. In the Admin section of the Work Portal select the Users option. On the new screen click New User. •Name: Name of the user to be created. •User name: User name of the user to be created. This field cannot contain special character nor spaces. •Domain: Domain of the network to which the application belongs to. •Notify by Mail: This checkbox defines whether the user will be notified by mail. In order to receive this notifications, enable Automatic Notifications in the process model. For more information, refer to Automatic Notifications. •Contact Email: Email address where the notifications generated from the application will be sent. •Contact cellphone: Cellphone number for multifactor authentication for Bizagi Authentication. 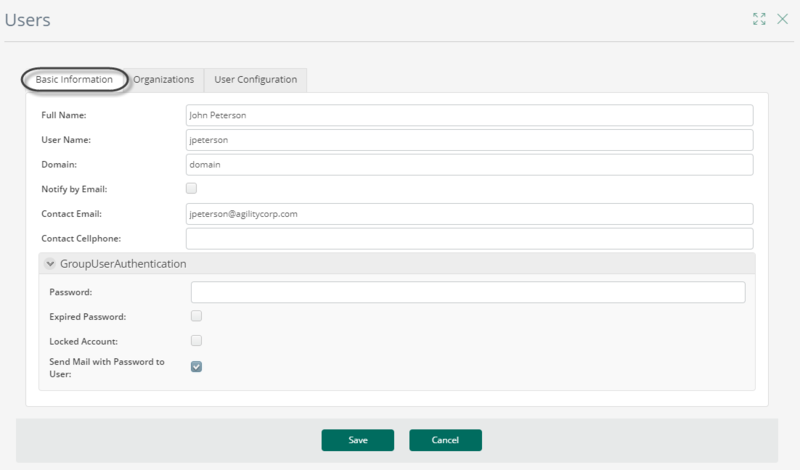 •Password: Defines the password to be used to configure the type of Bizagi Authentication in the Bizagi Studio Security component. If the filed is left blank an encrypted random password will be generated. •Expired Password: Option to expires / unexpires the account. This box is checked if the property Enforce password change after firts login is selected in Bizagi Studio Authentication menu (Security module). This will force users to change the password in their first login. •Locked Account: Option blocks / unblocks the user to access the Work Portal. •Send Mail With Password to User: Option to send an e-mail to the new user to inform his/her password. •User Properties Required: When User Properties have been defined from Bizagi Studio and they are required, they will be displayed in this tab in order to include the information related. •Organization: Organizations to which the User belongs to. A user may belong to one or more organizations. •Location: User’s geographic location. A user belongs to a single Location. •Positions: Positions of the user. A user can have one or more positions, according to the Organization. When an Organization is chosen, the Position menu is displayed. You can either scroll or use the search control to find the organization(s) you look for. To add or remove Organizations and positions, select an item and click an arrow: . •Active: Indicates whether the user is active or not to enter the Work Portal. •Skip assignment rules on cases created by this user: Defines if the cases created by the user will evaluate assignation rules. If checked, every activity of a case created by the user will be assigned to the logged user. •Area: Department or area that the user belongs to in the organization. •Boss: Defines the immediate superior person of the user. •Roles: Role performed by the user in the organization. In Bizagi, a user can have one or more roles. Once you have created the user, select the role and click Add. 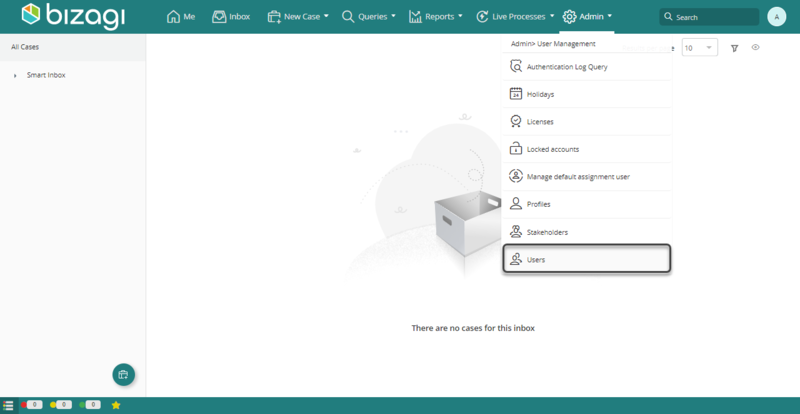 •Admon viewer: The user can only view Users and Entities options in the Admin menu. They don't have permission to edit, create or delete information. •BA Business Administrator: This is a super user role where the user can bypass security validations on cases. They can view cases and the case folder from those that do not belong to them even if those cases have Case Security. •Skills: Skill or ability to carry out an action. Special skills that allow a person to carry out an activity. In Bizagi, a user can have one or more skills. Once you have created the user, select the Skill and click on the add button. •Delegated User: The user who is delegated the functions of the main user. •Delegate Enabled: This option allows delegation of user's tasks to a delegated user. The user’s current pending activities can therefore be visualized and carried out by the delegated person. o The delegated user can see the information on who delegated the task on the tools menu, in the preferences option. o The delegated user can also see the delegated cases on the upper part of the activities screen. •Enabled for Assignation: When a user is enabled for assignment, he/she can be assigned activities within a process if he/she fills a specific profile. •Time Zone: The 24 main regions that allow a user to identify the Local Time according to the position of the city or country in the World. If your project requires multiple users to be in different time zones, this parameter is a must, along with the project's Business option: server time zone. oIf a user does not have a timezone defined, Bizagi will assume he/she is using the project's timezone. So all dates will be displayed to this user, using the project's timezone. oIf a user travels, changing timezone, Bizagi will still consider the timezone defined in his/her preferences. It will only change if the Preferences are updated. However the update will affect every single date the users sees. Keep in mind that the project's TimeZone configuration must match that of the WebServer and Database. •Language: Defines the language in which the Work Portal will be displayed to the user. You can either scroll or use the search control to find the role(s) and/or skill(s) you look for. 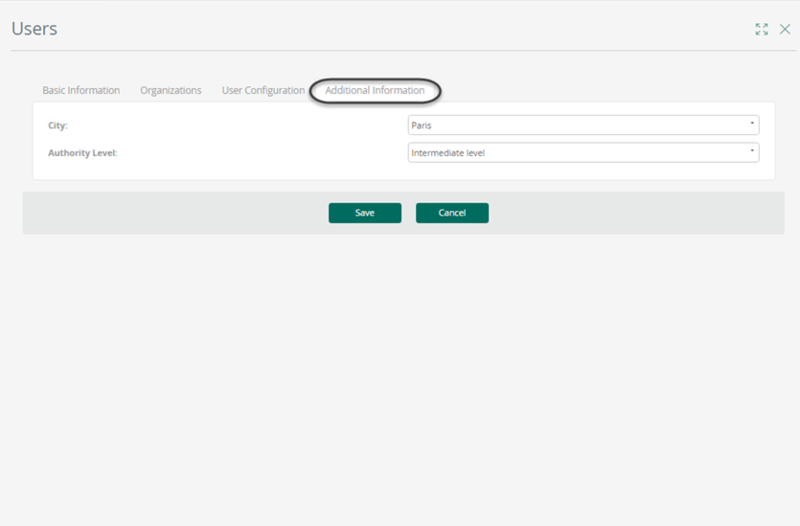 The Additional Information tab is displayed only when User Properties, that are not required, have been defined in Bizagi Studio. In this you can include all the information related to them. 3. When you have finished filling in the information, click Add to save the new user’s information. User's information will be taken to production in the first deployment. Henceforth user's administration must be any performed directly in the production environment. 1. 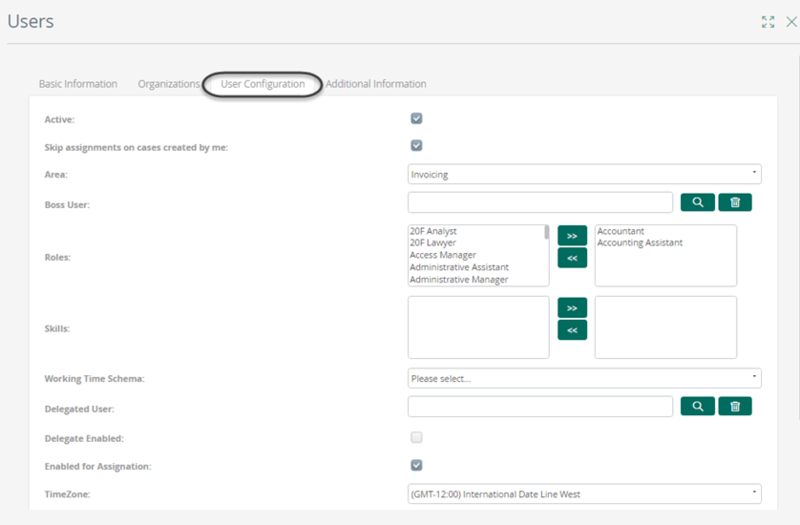 In the Admin section of the Work Portal select the Users option and look for the User that will be edited by entering the Domain, User Name or Full Name as search criteria. If these fields are left blank, and Search is clicked all the users will be displayed. 2. Click Search. A list of users that fill the search criteria will be shown, including some user information to help the identification (Id, user, domain, name and e-mail). •Edit: Displays the user administration screen to modify the user's information. •Log: Presents information on modifications made to the user attributes, who made them, the value given them, and the date. The type of change indicates if the property was added, modified, or eliminated. Click on the Edit link of the user whose information will be modified. 4. The User administration window will be displayed to make the necessary changes. When you are done, click Save.